If you are interested in green building, sustainability and our environment, please consider joining our Chapter family. Membership allows you to get plugged into continuing education, GREENworking and advocacy efforts that will enrich your neighborhood, city and region, as well as be value-added for your career. Consider, too, take it a step further by taking a volunteer role or assisting in developing education, information and outreach programs that are specific to your local industry and social community. Free CEs for LEED APs and Green Associates tied to education offerings. Improving the energy and environmental efficiency of the whole building environment. Reduced fees, advance notice, and priority registration for Chapter and Branch programs, LEED workshops, educational sessions ... and more. Listing in the Chapter's online, searchable Membership Directory, and direct access to the Chapter’s member community. Participation in advocacy matters affecting energy and environmental efficiency. Ability to serve on Chapter/Branch committees and the Board of Directors, with voting rights in elections. Through partnership with BuildingGreen.com -- a resource for sustainable building practices -- access to a 25% discount (use the following promo code: T09AA8C9). Chapter Member -- $80 -- Members receive local Chapter-member benefits, discounts and are permitted to vote in Chapter elections. National Member -- $55 -- This discounted membership is available to only to employees of a USGBC National Member Company (see copy at right). Students -- $30 -- This discounted membership is available to full-time students (proof of full-time status upon request). Emerging Professionals -- $30 -- This discounted membership is available for individuals under 30 years of age or four years after college graduation. Dues are renewed annually one year from the date of joining. For more information, contact Lee Cooke (561-373-7367). Your membership profile is one of the most valuable of many benefits of membership. Be sure to create and update yours! Note that changes to member profiles on the USGBC National site will not be reflected in the Florida Gulf Coast Chapter website. To update the information in your Chapter-member profile, follow the instructions below. Login by entering your email address and password in the upper right corner of the page. If your password doesn’t work, click the Forgot Password link next to the Login button and follow prompts. If prompted to login as an administrator or member, select member. Once signed in, click the View Profile link under your name in the upper right corner. Update the necessary information and click Save at the bottom of the page. On this page, you also have the ability to change your password, alter your privacy settings, edit your event-specific email subscriptions ... and more. 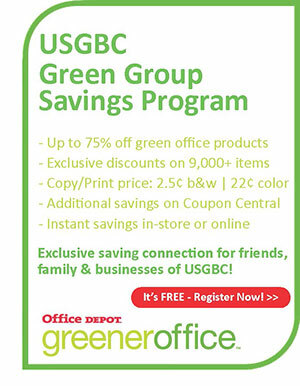 If you need any assistance with updating the items above, please contact info@usgbc-fgc.org. The USGBC's national members are organizations, corporations, companies and institutions across the globe. Any company that shares the goal of a more sustainable built environment should consider joining USGBC National. Member organizations come from every industry -- representing big companies and small businesses to nonprofits and governments –- and the benefits of membership extend to all full-time employees -- including discounted membership with the USGBC Florida Gulf Coast Chapter. USGBC National recognizes that every organization has different needs, and membership categories have been structured according with only four dues levels: Organizational, Silver, Gold and Platinum. These dues packages make things simple, allowing you to choose the membership level and price point best suited to your needs. USGBC members represent the best organizations from all fields. Our members are local and international, big and small, mission and market driven. They make an impact within their sphere of influence and advance the movement for a more sustainable built environment. Join us -- at the local Chapter level and the national level -- to connect with other industry leaders. The USGBC brings you together like no one else can.